When your small pond starts looking dirty, it may be that your fountain is not working properly. 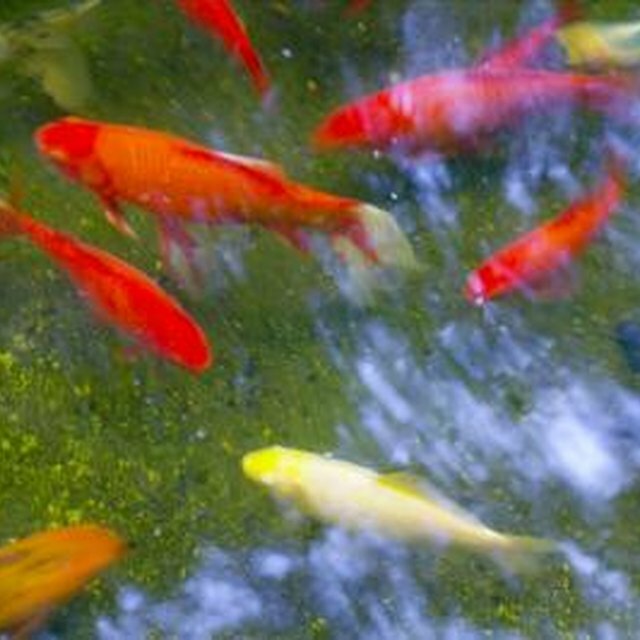 A dirty pond is unattractive and can hurt your pond plants and fish. To get everything back in balance, you need to clean your small pond's filter. According to University of Rhode Island Extension, a mechanical filtration system, which pumps the water through a spongelike foam pad, should be cleaned about once a week for peak effectiveness. Plants provide a natural filter for your pond. Turn off all electricity to your pump. This means either turning off a switch, or removing an electrical plug. Never work on a pond pump or filter while electricity is on. Never have your pump running when it is removed from water, as this will burn out your pump's motor. Pull the pump and filter out of the water. Remove the filters from the pump, and the filters from the cartridges. Your pump may only have one filter -- the one in the picture has two. If your filters are attached to the pump with clamps, you may have to use pliers to pull them off. Most small filters are not attached with clamps. Some are attached with adjustable O-clamps, in which case you'll need to use a screwdriver to loosen the clamps. Wash the filters either in the sink or with the hose. Use a sponge-squeezing method to clean the filters. Clean the filter sponges until the water running from them is clear. They do not need to be spotless. If they are deteriorating, you need to replace them. If the filters have become misshapen or compacted, you should buy new filters. If your local home garden center does not carry them, most online pond stores have them. Rinse out the inlet/outlet on the pump to clear any obstructions. Rinse out the hose connecting to your fountain's sprayer. Put the filters back into their cartridges, and reattach the filters to the pump. Turn the pump back on by either flipping the switch or by plugging it back in. Your small fountain should now work fine. If your pump is working, but the water flow to your fountain is still not at peak volume, the hose may be obstructed, in which case you need to replace it. With a new hose, your pond feature should work well. How Often Should I Change a Hot Tub Filter?